The revised successor to the North American Free Trade Agreement (NAFTA) is once again officially a trilateral deal. Meeting the midnight deadline allows the countries to sign the deal with Mexico’s outgoing president, Enrique Peña Nieto, before he leaves office on December 1. President Donald J. Trump said he plans to sign the agreement by the end of November and then will send it to Congress. However, Congress likely won’t vote on the agreement until next year, as it still has a number of procedural hurdles to clear under the Trade Promotion Authority (TPA). In a Monday morning news conference from the Rose Garden, President Trump described the new U.S.-Mexico-Canada-Trade Agreement as being the most modern, up-to-date and balanced agreement, with the most advanced protections for workers ever developed. President Trump mentioned that Mexico President-Elect Andrés Manuel López Obrador has worked closely on the new USMCA trade deal and that they have since established a good working relationship. President Trump also thanked Prime Minister of Canada Justin Trudeau for the work he has put into getting the deal done. The revised NAFTA deal improves access to Canada’s dairy market for U.S. farmers, giving U.S. exporters an estimated additional 3.59% market share. It also provides for stronger intellectual property provisions, and tighter rules of origin for auto production according to two senior Trump administration officials. The California Chamber of Commerce looks forward to learning more details of the new USMCA trade deal. The CalChamber urges Congress to approve the new USMCA agreement, following the objectives and procedures of the TPA. The recently agreed upon U.S.-Mexico deal was written to last for 16 years, but would allow the countries involved to revise or modernize aspects of the deal every six years. It is unclear whether this was taken into the trilateral deal under the new USMCA. If so, the pact would continue for another 16 years after it is revised. 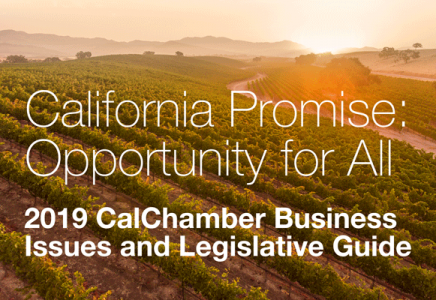 Originally, the CalChamber has opposed the proposed five-year sunset clause, as a forced re-examination of the pact on such a short time frame would cause uncertainty for all parties.